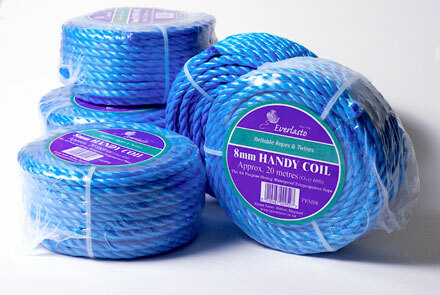 James Lever are manufacturers and suppliers of handy coils of blue polypropylene rope. 15 and 30 metre handy coils are available in thicknesses of 6, 8, 10 and 12mm, 20 metre handy coils are available in 8mm and 10 metre handy coils are available in 12mm. Our handy coils are labelled Everlasto brand and individually shrink wrapped.